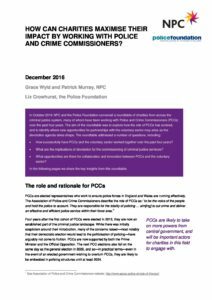 This report summarises key insights from an event hosted by NPC and the Police Foundation which explored how the role of PCC has evolved, and identified where new opportunities for partnerships with the voluntary sector may arise as the devolution agenda takes shape. How successfully have PCCs and the voluntary sector worked together over the past four years? What are the implications of devolution for the commissioning of criminal justice services? What opportunities are there for collaboration and innovation between PCCs and the voluntary sector?